Il diluvio universale (The great flood) is an azione tragico-sacra, or opera, by Gaetano Donizetti. The Italian libretto was written by Domenico Gilardoni after Lord Byron's Heaven and Earth and Francesco Ringhieri's tragedy Il diluvio (1788). The opera premiered at the Teatro San Carlo, Naples on 6 March It failed to become an instant success. It is known that for the premiere production to be accepted, it had to be given to the church censors in the form of an oratorio, since its planned production date was within the period of fasting. It was only allowed due to its being a biblical story. 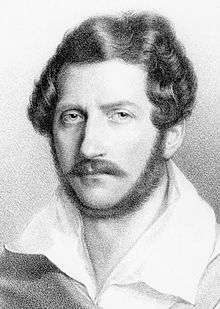 Donizetti revised the opera and a new production opened on 17 January 1834 at Genoa's Teatro Carlo Felice. But after another staging in 1837 in Paris, it disappeared for 147 years. The opera was not presented again until 1985 in Genoa. The first production in Switzerland took place at St. Gallen where, since 2006, an opera is presented in the open air in front of the Cathedral around the first weekend of July. The production of Il diluvio was also given at the St. Galler Festspiele 2010 when Mirco Palazzi, Majella Cullagh and Manuela Custer appeared. The opera tells the biblical story of the great flood. ↑ Francesco Ringhieri: Il diluvio. Tragedia. Antonio Zatta e figli, Venice 1788 (Online-Ressource). ↑ Black 1982, p. 25: Black notes that 28 February was the intended date, but due to illness, the premiere had to be postponed.